A fat in which the carbon atoms are fully hydrogenated, found in animal products. A diet heavy in Saturated Fats and Trans Fats are thought to raise cholesterol in the bloodstream. Saturated fat consists of triglycerides containing only saturated fatty acids. 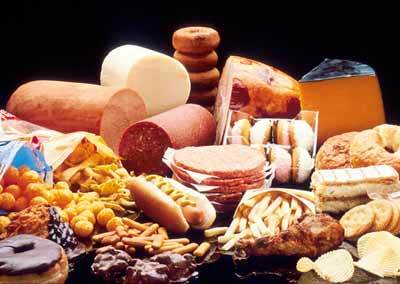 Saturated fat is mostly found in foods that come from animals like meat, egg yolks, and milk products. Trans fats are found in many convenience foods like French fries, doughnuts, cakes, and cookies. Polyunsaturated fats are simply fats that have more than one double-bonded (unsaturated) carbon in the molecule. Monounsaturated and polyunsaturated fats are by and large found in plants and are publicized as healthy fats. Substitution of Saturated Fat and Trans Fat with Monounsaturated Fat and Polyunsaturated Fat help to lower LDL cholesterol when eaten as part of a healthy diet. One of the most commonly used ingredient in cooking and baking is Oil and Butter, it is important for us to know which ingredient is better than other for our health. Comparison is given in the table below. weakness when energy are very low. To say the least, the diet is definitely safe for use in the long-term. depression, headaches, and breast tenderness and enlargement.